The United States men’s national team is 335 days beyond the disaster in Trinidad, but American soccer may never fully escape it. Just as the modern era of the game on these shores began when Paul Caliguiri struck a momentous goal from outside the box to qualify the team for the 1990 World Cup, the next age of U.S. soccer — wherever it may lead — began when the team fell to Trinidad and Tobago on Oct. 10, 2017, and missed the planet’s biggest sporting event for the first time in three decades. Where will it lead, though? The U.S. still is without a permanent coach. The interim boss, Dave Sarachan, has set aside the program’s most veteran and accomplished players and used almost exclusively guys who are 25 or younger. The most gifted American player, Christian Pulisic, will miss a fourth consecutive game Tuesday when the United States meets rival Mexico in Nashville, unavailable for that game and Friday’s 2-0 loss against Brazil because of a leg injury that caused him to miss Borussia Dortmund’s most recent game in the Bundesliga. It’s maybe a good thing FIFA delayed the 2022 World Cup in Qatar from summer to winter. Earnie Stewart, who began his job as national team GM last month, probably could use the extra time to prepare. 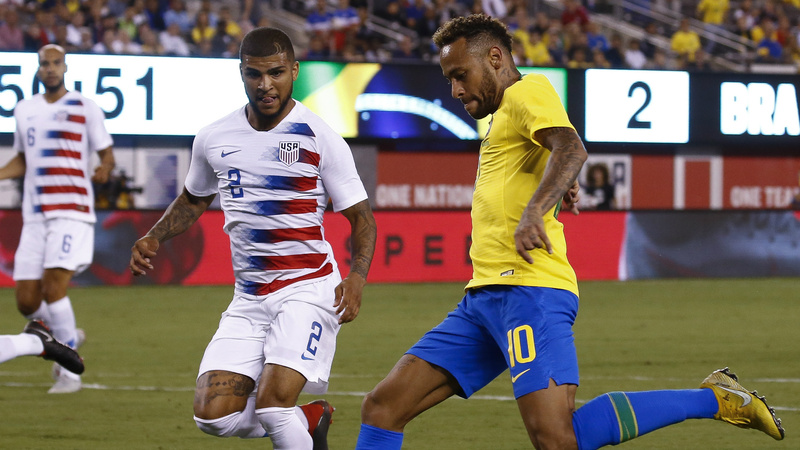 “I think we’ve got a great group of young players coming through: Tyler Adams, Weston McKennie, Pulisic, Matt Miazga, Cameron Carter-Vickers to name a few,” former U.S. captain Carlos Bocanegra told Sporting News. The U.S. has not excommunicated everyone who was on the field that night in Trinidad. For one, that would mean excluding Pulisic, whose performances in three seasons at Dortmund and in 21 appearances for the U.S. have indicated he could be the best American field player to date. It also would mean getting rid of striker Bobby Wood, winger Paul Arriola and right back DeAndre Yedlin, each of them 25 or younger. Forward Jozy Altidore, midfielder Michael Bradley and winger Darlington Nagbe have not appeared for the U.S. since, however. Whether the permanent U.S. coach will decide to return them to the national team program is impossible to say. It is becoming more evident, though, that when the U.S. begins to qualify for Qatar 2022 it will do so with a team that has spent more than two years building a sense of style and cohesion but without much experience in terms of going on the road in the CONCACAF region and fighting for the results necessary to reach the World Cup. Pulisic and Woods have done that, and so has German-American defender John Brooks. But McKennie, Adams, teenaged forward Tim Weah and outside backs Antonee Robinson and Shaq Moore haven’t. ESPN analyst Taylor Twellman sees a younger U.S. squad as a potentially positive development. He contends the American system is functioning well at developing players up to age 14, but then the variety of options available to them at that point – dig in with an MLS academy, move to Europe if that option is available, take the college track – don’t always lead easily to breaking through to high-level pro success. “I don’t think we’re that far off regarding the player development up to the age of 14-15-16. I really don’t,” Twellman told SN. “And I hear that from everyone around the world, so it’s not necessarily ­­­my opinion. “But then when you watch the World Cup, every time the United States was in, their first-time World Cup players were 26, 27, 28. It’s too late. It’s a young player’s game. Look at the French team: It’s the second-youngest team at the World Cup. The U.S. has not played Mexico since June 2017, when a goal by Bradley and a stirring defensive performance helped produce a 1-1 draw that led American fans to believe their World Cup qualification campaign was back on track. Introducing this young team to that level of intensity, even in a game that counts for nothing, most likely will be a positive. It would be more so if Stewart had, by now, hired a coach instead of just, as he told reporters Thursday, developing a profile of what the federation wants the next person to be. It is more important, though, to get it right than to get it done. “I think a period of quiet, a period of realization — to understand who we are, what we are, what we’re good at, what is possible, what goals we need to shoot for, and a better way of playing – that to me is what is important,” Janusz Michallik, a former national team player now with ESPN and Sirius/XM, told SN. “I think then we have a better opportunity to not only qualify all the time, but once you qualify to actually maybe be formidable to some degree.